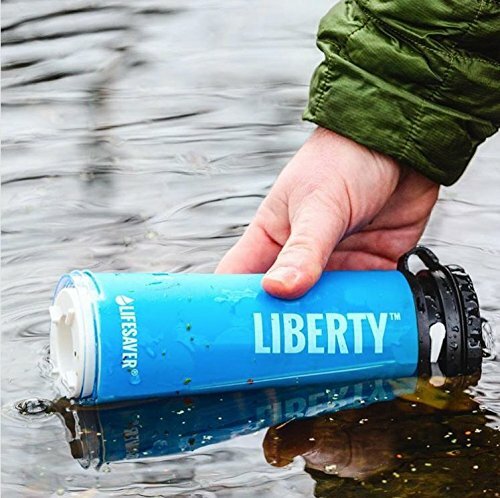 The deal with these portable water filters is that they can clean apparent dirty water instantly, allowing you to drink direct from the source. There are no chemicals involved, and certainly no boiling of the water to be consumed; merely a clever kind of filter through which water is drawn. 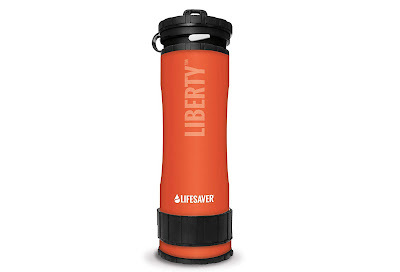 In the case of the Lifesaver Liberty, that filter can remove... deep breath... 99.999% of viruses, 99.9999% of bacteria, and 99.9% of cysts. Basically, water that has passed through this thing will be cleaner than the water you get from the tap in your kitchen. 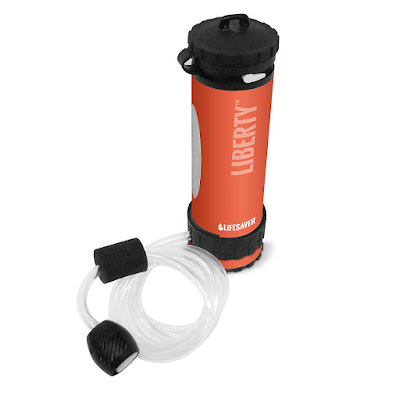 The Liberty is unique amongst other water filters in that it is both a dedicated filter pump, and also a portable water bottle. 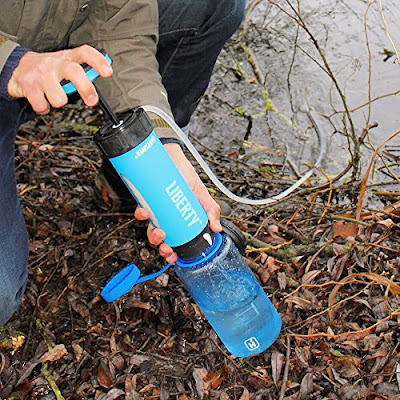 This means you can use it, with the included 'scavenger hose' attached, to continuously pump and clean water for a large number of people (2000 litres per replaceable filter cartridge), or simply unscrew the base, scoop up some water, give it a couple of pumps, and drink. Unlike the aforementioned Lifestraw Steel, the Lifesaver Liberty is fairly bulky and would probably pinch quite a bit of vital space in your pack, should you be taking it hiking or camping. There are other, smaller, water bottle filters out there, but none, however, that are also a pass-through pump. That's why we feel the Liberty is best suited for expeditions and trips with a group, rather than a solo adventure. To be fair, though, the Lifestraw can't filter out viruses; something the Liberty can. So there is that. 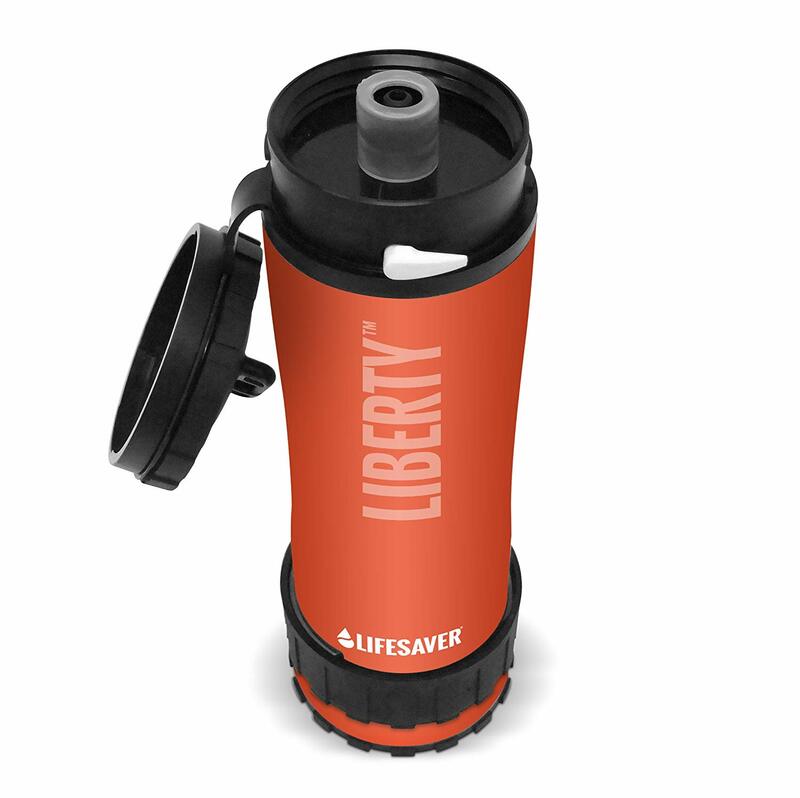 In use, the Lifesaver Liberty is very easy to use, and we found that the flow-through pump mode, which allows for a continuous trickle, generated about a litre of clean water for every minute of pumping. Fortunately the pumping process isn't at all strenuous, meaning pumping five to ten litres of water, for your camping party, is achievable without getting tired. Meanwhile, the internal capacity of the pour-in water bottle is 400ml, which isn't huge, but more than enough for an occasional sip for one person. Again, the whole product seems very much more efficient when packed for a larger group's needs. As for the filter itself, the Lifesaver Liberty is tough, well-made, and seems to be up to the task - both domestically and on a foreign trek. We have no doubts that the bottle and pump itself could last for years, while the replaceable filter element is convenient and long-lasting. The 'scavenger hose' is not stored inside the unit itself and will need to be carried additionally, but even so the total volume of the product isn't huge and shouldn't be a burden on a long trip. 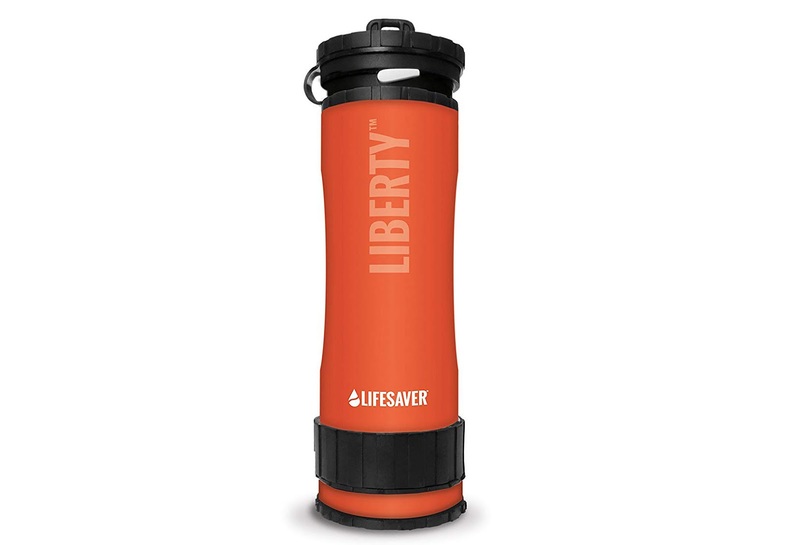 So if you (and, importantly, your team) are planning an expedition to somewhere clean water might not be that easy to source, you should definitely consider the Lifesaver Liberty.